Car Mate Trailers recognized All Pro Trailer Superstore, a dealership that sells trailers nationwide, as their #1 trailer dealer in the U.S. for 2015. This recognition by Car Mate Trailers is the 10th straight year that All Pro Trailer Superstore has received the honor. The success of our family owned and operated dealership wouldn't be possible without our strong partnerships with companies like Car Mate. All Pro Trailer Superstore, a dealership that sells trailers nationwide, was recognized by Car Mate Trailers as their #1 trailer dealer in the U.S. for 2015. This recognition by Car Mate Trailers is the 10th straight year that All Pro Trailer Superstore has received the honor. In addition to the latest recognition, All Pro Trailer Superstore has been one of Car Mate Trailers Top Dealers for over 25 years and in 2010, was named the Top Dealer Of The Decade by Car Mate Trailers. 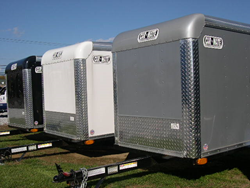 All Pro Trailer Superstore stocks hundreds of Car Mate Trailers at their dealership, located at 6799 Carlisle Pike in Mechanicsburg, PA, that consists of custom cargo and enclosed trailers that come in a variety of sizes, shapes and colors to suit the needs of customers. "We are extremely honored to receive this recognition from Car Mate Trailers," said the owner of All Pro Trailer Superstore Scott Smith. "The success of our family owned and operated dealership wouldn't be possible without our strong partnerships with companies like Car Mate. We are proud to offer our customers with affordable, high quality trailers like Car Mate and continue to strive towards 100% customer satisfaction." Along with interior upgrades, customers can also customize the exterior of their trailer with windows, colors and more.